A great place to bask in the fabulous outdoors Almondsburybestows you with, The Bristol Golf Club has got to be on yours list of things to do in Bristol. 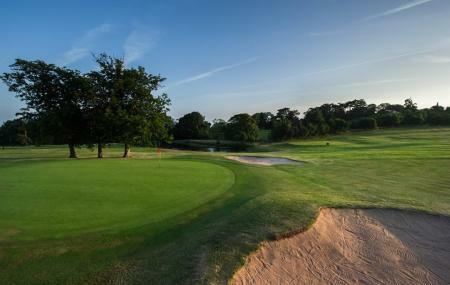 This is 18-Hole Golf Course that has you playing on some of the best terrains of the Severn Estuary. It doesn’t matter if you are not an expert, for there is a 9-hole course too best to practice your skills. Apart from golf, you can indulge in leisurely activities like eating and drinking too. Use Almondsbury trip planner to visit The Bristol Golf Club and many others to your visit. You can enjoy a comfortable stay in the city by booking the best hotels in Almondsbury like Days Inn Bristol Hotel Gordano, Castle View Bed & Breakfast, Thornbury Lodge and The Beaufort Hotel. If you want to add the visit to The Bristol Golf Club in your trip, you can choose from the variety of Almondsbury vacation packages that can be designed to suit your preferences. These packages also cover your major concern of how to reach Almondsbury. Love this? Explore the entire list of places to visit in Almondsbury before you plan your trip. Fancy a good night's sleep after a tiring day? Check out where to stay in Almondsbury and book an accommodation of your choice. How popular is The Bristol Golf Club? People normally club together Mundy Playing Fields and Blaise Hamlet while planning their visit to The Bristol Golf Club. First time visiting here and the welcome from the staff was excellent. Straight over to show us which room our training was in. As the day progressed, we asked for a coupley extras and the response was so quick and accurate. Our trainees reported a similar high standard. Really like this course. Plenty of variety of golf hole here to test any golfer. High handicapper golfers be warned though there are a couple of very long par 4 holes and a par 3 which is designed to punish you. So take plenty of balls. Very snooty. Why have FootyGolf and say you cater for stag parties if you don't like the people on them?! The FootyGolf course was poor. Muddy, flooded holes and not clear at all which flags are on which holes. I wouldn't waste your money. Although the ground was quite soft all the greens were in play, but nearly all the tees were off mats. The greens were quite bobbly but that's winter golf. The clubhouse is friendly and serve hot and cold food.